Looking to escape urban stress for a weekend? On this weekend-retreat, you’ll re-connect with nature, get some outdoor exercise, learn some new training techniques and come away with a new sense of life-balance. The area around Tobermory and the Bruce Peninsula is considered a paradise by naturalists around the world. We’ll be mixing a variety of outdoor activities and adventures designed to take you out of your current environment and kick-start your early summer fitness program. Enjoy the clean air, water and beautiful scenery as you get re-vitalized! * Price is per person, based on double occupancy and is inclusive of accommodations (Friday and Saturday nights), meals, guided hikes and fitness activities. Single and premium rooms available for a surcharge (please inquire). Tobermory is located just north of the Bruce Peninsula National Park, about 300km northwest of Toronto. We’ll kick things off at 7pm on Friday with a light dinner overlooking Georgian Bay, and wrap up on Sunday after lunch. 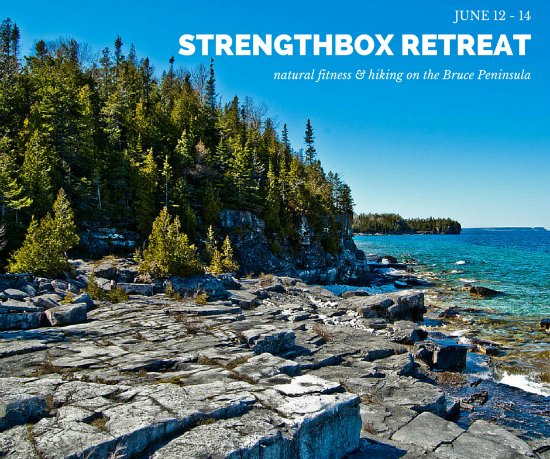 You don’t have to be a StrengthBox client to enjoy this weekend — the retreat is open to all who can get to Tobermory that weekend (carpooling from Toronto may be available), and it’s suitable for all fitness levels. June is the perfect time of year to visit the Bruce Peninsula and the Niagara Escarpment! Please register now to secure your spot(s), as spaces are limited.